workers converged on Bolivia’s second capital to block hardline rightist Vaca Díez from taking office. For a Workers, Peasants and Indian Government! June 9 was a day when Bolivia came to the edge of civil war, but the bourgeoisie suddenly pulled back from the brink. Faced with the burgeoning mobilization of miners and peasants, they decided to switch tactics. Up to the last minute, right-wing forces backed by the U.S. embassy had been pushing to install hardliner Hormando Vaca Díez as president. They were happy to see Carlos Mesa go, blaming him for failing to defeat the mass demonstrations demanding nationalization of the country’s oil and gas resources. By the end of the day, just before midnight, Congress swore in a stop-gap president: Supreme Court head Eduardo Rodríguez. “Harvard Boy” Rodríguez, who has been an advisor to the U.S. embassy, was proposed by Mesa and Evo Morales, leader of the peasant-based Movement Toward Socialism (MAS). Bolivia’s rulers counted on Morales to demobilize his “troops” in return, which he did. By Friday morning, blockades were being lifted from roads around the country. As Thursday dawned, it looked like Bolivia was heading for a coup d’état. Dressed in battle fatigues and flanked by the rest of the Military High Command, Admiral Luis Aranda (Bolivia doesn’t have access to the sea, but it does have a Navy) announced at a morning press conference that the armed forces were on a “state of high alert” and prepared to “act if necessary.” On TV you could see behind the commander in chief a figure moving silently in the shadows. It was Gonzalo Valenzuela, a lawyer who was the advisor of the narco-dictator Luis García Mesa and who organized the bloody repression of the 1985 miners’ “March for Life.” Aranda declared that the military (“the last bastion of the fatherland”) was opposed to anything that went against the constitution, including the proclamation of a “National Popular and Indigenous Assembly” the day before in El Alto. Calling on Bolivians to “avoid national suicide by calling a political and social truce,” a communiqué by the High Command pledged to defend the “constitutional succession.” The generals’ call on Congress to “listen to all the actors who are making their voices heard” was seen as an admonition to Vaca Díez. As head of the Senate he was first in line to succeed Mesa when Congress convened in Bolivia’s second capital, Sucre, later in the day. It was further reported that Mauricio Balcázar, brother in law of ex-president Gonzalo Sánchez de Lozada (“Goni”), as well as Eduardo Sfeir, a former advisor to the U.S. embassy, traveled to Sucre on the plane with Vaca Díez. Balcázar was at a meeting in Washington in March, along with Goni and his “minister of death,” Carlos Sánchez Berzaín (Bolivia’s interior minister during the October 2003 massacre), where a plot was hatched to install Vaca Díez as president and oust the “vacillating” Mesa. Hormando Vaca Díez arriving in Sucre for emergency session of Congress, escorted by military officers, June 9. A few hours later he fled to army base to hide from demonstrators. Vaca Díez is a sinister figure. Backed by the same “mega-coalition” that supported the mass murderer Goni, he is a leader of the misnamed “Revolutionary Left Movement” (MIR). The latter was founded in 1971 amid the resistance to the coup by General Hugo Banzer, but in the 1980s became a junior partner in the second Banzer government. 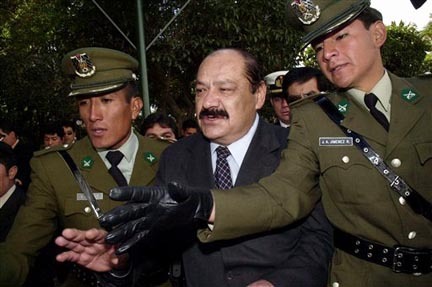 Vaca Díez was part of the wing of the MIR linked to major drug traffickers under the Banzer regime, and was implicated in judicial investigations of drug money funneled to MIR leader Jaime Paz Zamora. Vaca Díez earned the thanks of American ambassador David Greenlee by seeking to legislate immunity for U.S. forces in the country. (The bill failed in the face of vociferous opposition from workers and peasants.) In recent days, the Senate president won embassy support for a plan to declare a paper “nationalization” of gas and oil that left the “multinational” energy companies in control, while cracking down on protests. What Vaca Díez means by “imposing order” on the country was shown by an incident in March 2004. A distraught miner, Eustaquio Picachuri, “invaded” the main hall of Congress protesting against the pensions law which wiped out the retirement of several thousand former mine workers. The haughty response of Vaca Díez was to order the military to “remove that terrorist from my palace.” When officials sought to subdue him, Picachuri set off dynamite charges that blew him apart. The U.S. embassy hailed the “anti-terrorist” action of the Senate president that killed Picachuri. Vaca Díez is a senator from Santa Cruz in the east and is closely linked to the local oligarchy that finances fascistic goon squads that have viciously beaten Indian demonstrators. Although Congressional leaders moved the vote to Sucre to escape the pressure of the masses in La Paz, thousands of workers and peasants began converging on the city. Sixty trucks filled with miners were reported on the way from Oruro alone. By mid-day Thursday, rather than a coup it appeared Bolivia could indeed erupt in civil war. In Sucre, soldiers were photographed bringing boxes of ammunition into the legislative palace. As local workers marched on the Plaza 25 de Mayo, police kept them at bay by gassing the crowds. 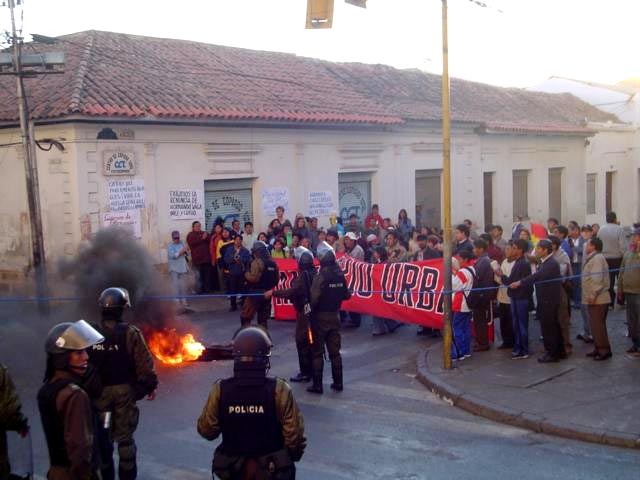 The angry opposition to Vaca Díez’ power grab was brought to the boiling point at 1:30 p.m. when army troops shot and killed a cooperative miners leader from Potosí, Juan Coro Mayta, on the road from Yatolo to Sucre. The La Paz daily La Razón wrote with disdain of Mesa’s fear that a “muertito” (one little dead person) could bring down the government. Now a miner had been killed in order to install Vaca as president, and the masses erupted. A peasant leader from Chuquisaca declared, “Vaca Díez will only leave Sucre torn limb from limb.” The Senate leader fled to a military base for protection; other Senators sought refuge in the government palace or hotels. By 6 p.m., it looked like Vaca could be lynched. At that point, Vaca called it quits and, no doubt after frenzied phone calls with the U.S. embassy in La Paz, the decision was made to appoint Eduardo Rodríguez, chief justice of Bolivia’s Supreme Court, as the new “constitutional” president. In a hurried session of Congress, Rodríguez was sworn in at a quarter to midnight, without a presidential sash for the photographs, and received an embrace from Vaca Díez. Evo Morales and many other leaders of peasant and labor organizations had seized on the masses’ justified hatred of this belligerent rightist to focus demands on “No to Vaca,” setting the stage for yet another “negotiated transition” to yet another capitalist president to carry out the orders of U.S. imperialism and the local ruling class. Morales called for Rodríguez to be named president in order to organize early elections. Yet Rodríguez is not only a political associate of despised former president “Goni,” but a business associate as well: in his private practice the Harvard-educated lawyer defended mining companies owned by Sánchez de Lozada and his clan. 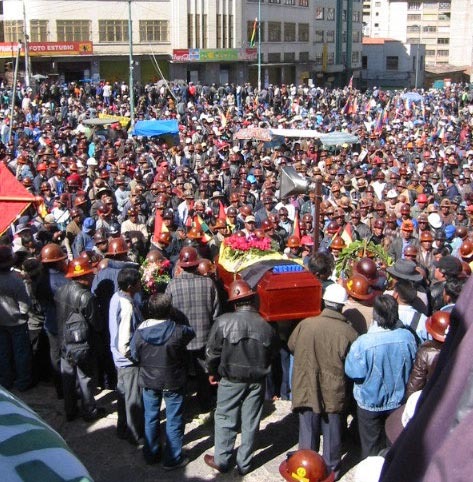 Tens of thousands attend symbolic funeral in La Paz June 10 for cooperative miners leader Juan Coro Mayta killed by army on road to Sucre. Morales and other leaders of the MAS called for a “truce” and an “intermission” in the struggle, to give Rodríguez time to carry out his “commitments.” Yet Rodríguez, like Mesa before him, has not said a word in favor of nationalizing the gas and oil companies, and the “accelerated” elections have yet to be scheduled. So after weeks of massive demonstrations against the Mesa government, road blockades and running battles between protesters and the police and army, what comes out of it is … a Mesa II government. Right-wing politicians, joined by La Razón – still smarting over the failure of Vaca’s attempt to grab the presidency – point to agreements Mesa signed with cooperative mine enterprises in order to accuse him of using the cooperative miners to attempt “genocide” – against the parliament! For their part, opportunists will declare this a “partial victory,” but although the extreme right-winger was blocked, another rightist oligarch was installed in his place. Meanwhile, many highway blockades are lifted and strikes interrupted. This is not any kind of a victory but a setback to the workers’ and peasants’ struggles against the imperialists, their energy cartel and the semicolonial government that serves them. And whether or not the “intermission” is brief or extended, the fact is that this setback was prepared not only by Morales, but also by the sometimes militant-talking labor and peasant leaders who sought “unity” with the leader of the MAS and then cry “traitor” as he sells out. Morales is only doing what they all did in October 2003, and what he did again during the July 2004 referendum on gas, when he served once more as a crucial prop for Mesa. His is a betrayal long foretold. In March, the last time Mesa offered to resign as president, the COB union federation, the MAS of Evo Morales, the CSUTCB of Felipe Quispe, the Regional Workers Federation (COR), Federation of Neighborhood Councils (Fejuve) and other organizations of El Alto joined in a “revolutionary unity pact” against “the multinationals and neoliberalism.” As soon as the new hydrocarbons (gas and oil) law was passed, this popular-front pact split and the squabbling began again. But they could get together in the first place because even the reputed radicals limited their aims to (bourgeois) “democratic” demands. Calls for nationalization of gas and oil and a constituent assembly do not go beyond the framework of bourgeois rule, nor does opposition to neoliberalism and multinational capitalist enterprises. Morales could join with them because they were “united” in support of (reformed) capitalism. Yet capitalism in this epoch of imperialist decay cannot be reformed in the interests of the exploited and oppressed. To rip Bolivia’s fabulous mineral resources away the imperialists, to genuinely enfranchise indigenous peoples and rescue workers from the scourges of unemployment and rampant poverty will require the working class taking power and beginning the socialist revolution that must spread internationally to survive. It also requires telling the truth to the masses: namely, that substituting one capitalist puppet president for another is no victory for the working people of the countryside and the cities. A Trotskyist vanguard party of the proletariat must be built that fights against the bourgeoisie and also against the opportunists who guard its left flank. Otherwise, the betrayal of October 2003 will be followed by the betrayal of June 2005, with more to come. In La Paz demonstrations, the most radicalized sectors have chanted “Workers to power!” Yet the leaders of the labor and peasant organizations offer truces and “intermissions,” first to Mesa and now to Rodríguez. Morales & Co. traffic in poisonous anti-Chilean nationalism, all the while hoping to cut a behind-the-scenes deal with U.S. imperialism. The leader of the MAS seeks support from social-democratic head of government Lula in Brazil, who is trying to play his role as a fireman for Washington in putting out the flames of revolt in the region while the Brazilian state oil company acts as a junior partner of the imperialists in looting Bolivia’s gas and oil fields. In contrast, a genuinely Trotskyist party would join with the workers of Chile, Brazil and throughout Latin America, as well as in the imperialist centers, in fighting for socialist revolution to sweep away the parliamentary dens of iniquity and replace them with the revolutionary rule of workers councils.